The Symmetry of Carnage 02 continues in series the body of work Lucy Ash has created to highlight LGBT issues. In 2011 she exhibited the series ‘Wrong Place, Wrong Time’ to raise awareness of hate-crimes, following the brutal homophobic attack on Ian Baynham, the brother of one of her closest friends. Other series and paintings including ‘Iris 02’ have further focused on this issue. The Symmetry of Carnage 02 was conceived in response to the centenary of WW1 and looks at the necessary invisibility of gay men who served in that war. Homosexuality was illegal and was not tolerated - it was regarded as deviant and immoral. The division of the painting into 11 x 11 rectangles signifies the moment of the end of the war; the 11th hour on the 11th day of the 11th month of 1918. Each of the 121 sections is built from thick earth/mud coloured oil paint tinged with red to mark the tragic spilled blood. 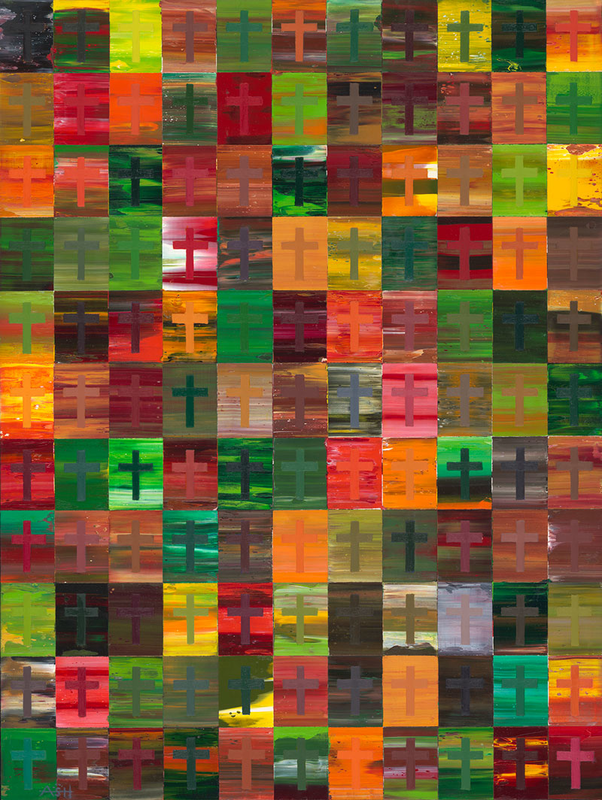 Within each section a cross represents a gay soldier who has had to blend in, in life. Now in giving his life for his country he disappears into the earth.